It's Not Too Late For Nest Boxes: Bluebirds, etc. According to our "nature activity time line," we usually suggest folks use winter months to construct bird nest boxes so they can have them in place no later than Valentines Day. This may seem a tad early for birding enthusiasts in colder northern states but it certainly works for Hilton Pond Center and elsewhere across the Carolina Piedmont. 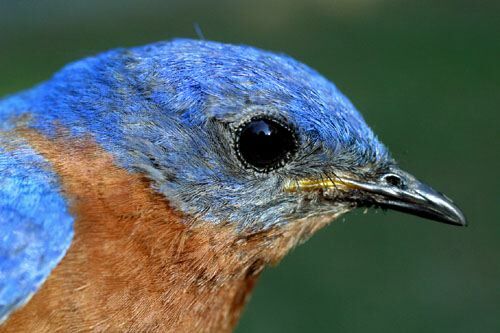 We've often seen established Eastern Bluebird pairs, for example, inspecting nest boxes in midwinter in anticipation of an early start on breeding, and numerous cavity nesting species also use boxes as out-of-the-weather winter roosts. Because of our extended Neotropical travels January through March, we're a little behind in 2010 on cleaning out old nest boxes or constructing and hanging new ones, but it's never too late to put one up for our local birds--or for yours. Our advice on offering nest boxes for birds is pretty straightforward: Keep construction simple, follow time-tested guidelines for box dimensions, put the box in the right place, and maintain the box on a regular basis. Although commercially available nest boxes may look pretty--or "pretty ugly," depending on your taste--there's no sense offering an intricately designed structure when all the birds want is a cavity with an access hole. Expensive commercially made copper-roofed boxes with fancy paint work are a waste of money. (The one at left, named "Le Chateau," is "fully functional with two separate nest cavities with an entry hole at each end protected by a regal balcony." It costs a mere $239 and the mounting base is $60 extra, but all shipping is free!) If you're making your own, why devote countless hours to creating just one of these elaborate structures when you could build a half dozen simple boxes in the same amount of time and help MORE birds? And remember, don't buy or build a "songbird condominium" with several nest holes and cavities; although communal nesting may be the norm for Purple Martins, it will never work with bluebirds, chickadees, wrens, or nuthatches that energetically defend their personal nest sites. Our SECOND-favorite nest box material is 1" cedar planking, available from most lumber yards and hardware superstores. (Vendors usually carry Western White Cedar. One can make a very handsome box from Eastern Red Cedar, but such material is expensive to buy.) Cedar is naturally rot-resistant, contains aromatic oils that may help suppress nest parasites, and doesn't need painting. You can use less-expensive pine planking for nest boxes, but the exterior--never the interior--needs to be stained or painted periodically and even then will likely not last as long as a cedar box. (Some of our cedar nest boxes around Hilton Pond are still functional after 10-12 years of annual use.) That said, our FAVORITE nest box material is that which can be salvaged from old houses, barns, sheds, etc. For the sake of the environment, it's better to re-use these materials than send them off to the landfill--even if the old lumber might not last as long as new cedar. Everybody seems to have a bluebird box that is "more successful than any other," but one we like (above right) involves all right-angle cuts and allows the box to be mounted atop a fence post or on a vertical pole, tree, or wall. (Click on thumbnail below left for to open a readable blueprint in a new browser window.) It's also deeper than most boxes, which serves two functions: 1) keeping nestlings in the box a day or two longer, thus enhancing their survival at fledging; and, 2) causing difficulty for predators trying to get to the nest. 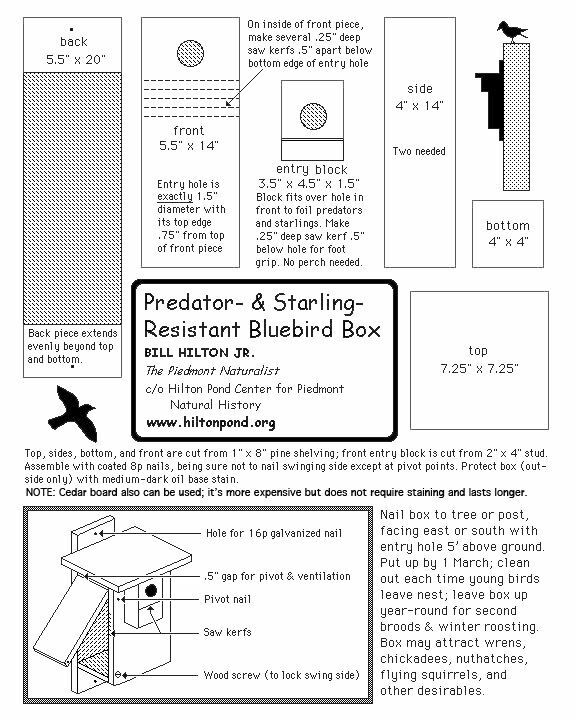 The 2" x 4" block mounted on the front of the box makes it even harder for mammals such as Raccoons and feral cats to bend their forelegs to reach eggs or chicks, and the additional thickness of the entry hole helps deter European Starlings--notorious non-native usurpers of bluebird nest boxes. 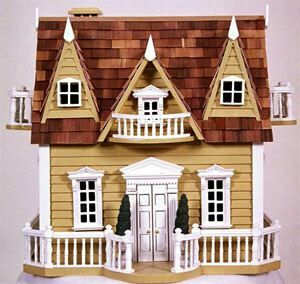 We have two additional suggestions if you use our plan above: 1) It's a good idea to seal the top to the back with silicone sealer; and, 2) If you have a spare piece of roofing shingle attach it to the top of the box to extend thestructure's life span. If you're trying specifically to entice Eastern Bluebirds (adult female above) to breed in your yard, the size of the nest box entry hole is important; it should be exactly 1.5", with a floor about 4" x 4". If the hole is bigger it admits European Starlings, smaller and bluebirds can't enter. However, if you're building the box for other cavity nesters you'll need an appropriately sized hole and you should make the whole box proportionally bigger or smaller. Be sure to buy, build, and erect nest boxes that can be cleaned out easily. These should have some sort of hinge and latch to allow humans--but not predators--to open the box for inspection. Given a choice, face a bluebird nest box toward the east so morning sun warms the box and dries out dew. (Face it west and you run the risk of prevailing winds blowing rain into the opening.) However, if the nestbox is on the edge of a field, ignore the compass direction and face the opening toward the field. Do NOT take down nest boxes during the winter. 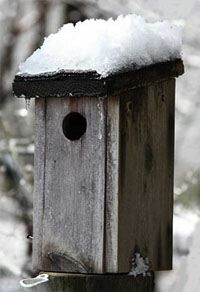 They often are used as out-of-the-weather roosting boxes by bluebirds, nuthatches, woodpeckers, and other bird species. Not later than 14 February (HINT: Valentines Day), check nest boxes and re-clean them if necessary. Bluebirds may spend all winter peeking into boxes and preparing for the spring mating season. Established breeding pairs may be on eggs by early April. Bluebirds typically use straw, grass, and/or pine needles to build a nest that, when completed, will have an unlined depression or "cup" in which the eggs will be laid. 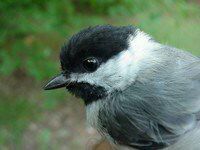 Other bird species use different materials, such as: Mosses, animal fur, and plant down (chickadees & nuthatches); leaves and sticks (wrens); pine-seed husks, bark strips, and cotton (nuthatches); and wood chips (woodpeckers). 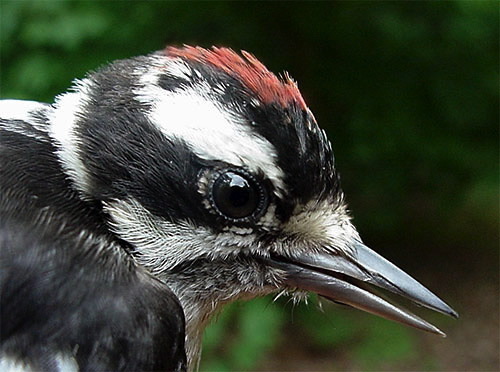 Nestboxes for woodpeckers (and perhaps nuthatches) should include woodchips in the bottom. These species, which typically excavate their own cavities, seem more at home in a box with a little "construction debris." Cedar chips may help deter nest parasites. ALL cavity-nesting birds in the United States are protected by law, except for on-native House Sparrows and European Starlings. Remember that suitable nesting cavities are relatively scarce in nature. Thus, one should welcome ANY protected bird that nests in one of your boxes. It's hard to rationalize why one should remove wrens or Carolina Chickadees (right) just because one would RATHER have bluebirds. Plus, such actions are against state and federal laws. If Tree Swallows compete with Eastern Bluebirds for a nestbox, try mounting TWO boxes back to back. The bluebirds often occupy one box and the swallow pair the other. Cavity nesters lay one egg a day until the clutch is complete. Bluebirds usually lay 3-6 eggs. Incubation usually does not begin until the last egg in the clutch is laid; this allows for a synchronous hatch so that all chicks are the same age. For a given female, first clutches in a particular year usually have more eggs than later ones. Bluebird eggs, which are pale blue (right)--rarely pure white--take about 13-15 days to hatch. 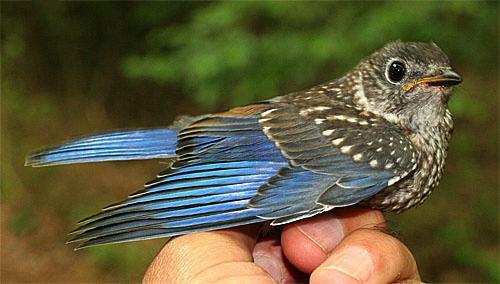 Try not to disturb an incubating bluebird female during the first 3-4 days of incubation. Chances are higher she will desert during this period. 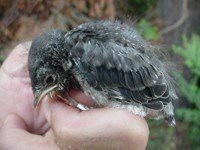 Baby songbirds, including bluebirds, are born naked, blind, and helpless. They are unable to thermoregulate (maintain their own body temperatures) for several days after hatch. Thus, try not to disturb a brooding female for a week after hatch date. 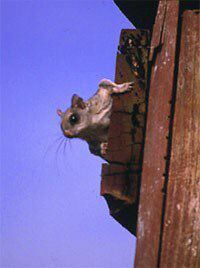 NEVER check a nest box on days that are cold, windy, and/or rainy, and NEVER check a box after mid-afternoon. If you spook a female too close to nightfall, she may stay off the nest. 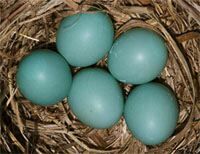 If a clutch of bluebird eggs doesn't hatch after three weeks, remove the nest and eggs to stimulate re-nesting. Likewise, if chicks die in a nest, discard everything and sanitize the box with a mild solution of bleach. Nestling bluebirds leave the nest about two weeks after hatch date. Thus, it's best not to open the box after about Day 11, lest premature fledging occur. Once baby bluebirds have successfully fledged, folks often remove the nest and brush out the box, but there is disagreement about whether this is a good practice. Some researchers report that nest removal may stimulate re-nesting; if nothing else, they say it gets rid of accumulated nest parasites (mites, blowflies, lice, etc.) that might adversely affect later broods. 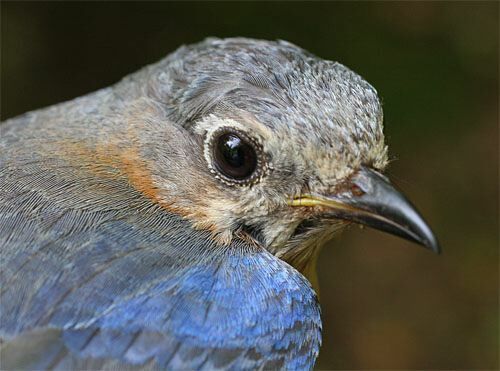 Other investigators report that bluebirds prefer nest boxes in which a nest from the previous season remains in the box, and that leaving the nest does not cause an increase in parasites the following year. Some even speculate that the old nest may harbor beneficial wasps that parasitize blowfly larvae that can kill nestlings. Many folks like to encourage bluebirds by putting out feeding trays with mealworms. 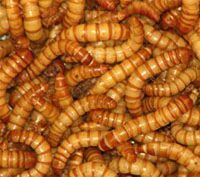 These protein-rich beetle larvae (right) can be raised fairly easily on dried oatmeal but otherwise are available from pet shops and mail-order sources. No matter how good your habitat or how well-constructed a nest box, there's no guarantee it will attract a tenant. Some folks put up a box and find it occupied the same day, while others go years before a pair of birds moves in. If a box goes unused for several breeding seasons in a row, you probably should move it. You can put up more than one nest box in a small area, but they'll probably end up being occupied by different species. Boxes intended for Eastern Bluebirds should be at least 100 yards apart. 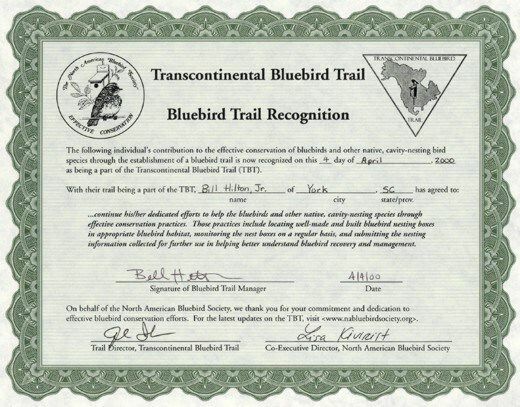 Consider starting a Bluebird Trail. If you live where there is appropriate habitat, talk to local farmers about putting up nest boxes along their fence rows. When you decide to create a trail, however, be sure to monitor it and keep your boxes in good shape. Even though March has ended it's not too late to put up a bird nest box this spring. Granted, some female Eastern Bluebirds are already incubating in southerly parts of their range, but not every pair of nuthatches or wrens has chosen a nest site for 2010. Spend a few hours this week building and hanging an artificial cavity and your next eggs may be in a nest box rather than an Easter basket. 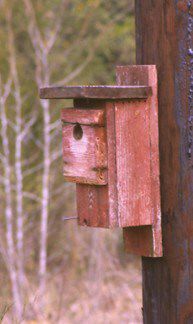 NOTE: If this installment of "This Week at Hilton Pond" stimulates you to build and erect a nest box for birds, please send a photo of your work--in situ--to INFO. Comments or questions about this week's installment? Please send an E-mail message to INFO. plus other nature notes of interest. Hilton Pond Center for Piedmont Natural History. You may wish to consult our Index of all nature topics covered since February 2000. You can also use our on-line Hilton Pond Search Engine at the bottom of this page. in the Subject line. Please be sure to configure your spam filter to accept E-mails from hiltonpond.org. If you enjoy "This Week at Hilton Pond,"
If you like to shop on-line, you please become a member of iGive, through which more than 750 on-line stores from Barnes & Noble to Lands' End will donate a percentage of your purchase price in support of Hilton Pond Center and Operation RubyThroat. For every new member who signs up and makes an on-line purchase iGive will donate an ADDITIONAL $5 to the Center. Please sign up by going to the iGive Web site; more than 200 members have signed up to help. It's a painless, important way for YOU to support our on-going work in conservation, education, and research. --Our first Ruby-throated Hummingbird of the year at Hilton Pond Center showed up at 2:24 p.m. on 31 Mar at a feeder outside our office window. He was an adult male in pristine breeding plumage--metallic green back, gray flanks, white upper chest, and brilliant red gorget. Our earliest record for a local RTHU was 27 March. --The Eastern Towhee male recaptured this week was banded at Hilton Pond Center as a local fledgling in 2003. At the age of eight years he continues to thrive despite a mild case of scaly leg mites on his legs. 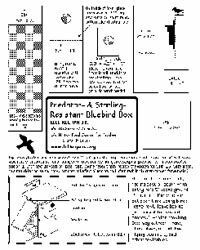 --With regard to our photo essay above, the North American Bluebird Society is an excellent source of information about cavity nesters, including blueprints for other styles of nest boxes. You may also be interested in the CAVNET listserv. Operation RubyThroat has teamed with EarthTrek so citizen scientists--like YOU--can contribute observations about hummingbird migration and nesting behavior. Membership is free for this great new opportunity to help increase scientific understanding of Ruby-throated Hummingbirds. On-line data entry forms for 2010 are now live, so please register today at EarthTrek. NOW is the time to begin reporting your 2010 RTHU spring arrival dates for the U.S. & Canada, and spring departure dates for Mexico & Central America. Please participate. Hilton Pond Center for Piedmont Natural History is a non-profit research & education organization in York, South Carolina USA; phone (803) 684-5852. Directed by Bill Hilton Jr., aka The Piedmont Naturalist, it is the parent organization for Operation RubyThroat. Contents of this Web site--including all articles and photos--may NOT be duplicated, modified, or used in any way except with the express written permission of Hilton Pond Center. All rights reserved worldwide. To obtain permission for use or for further assistance on accessing this Web site, contact the Webmaster.